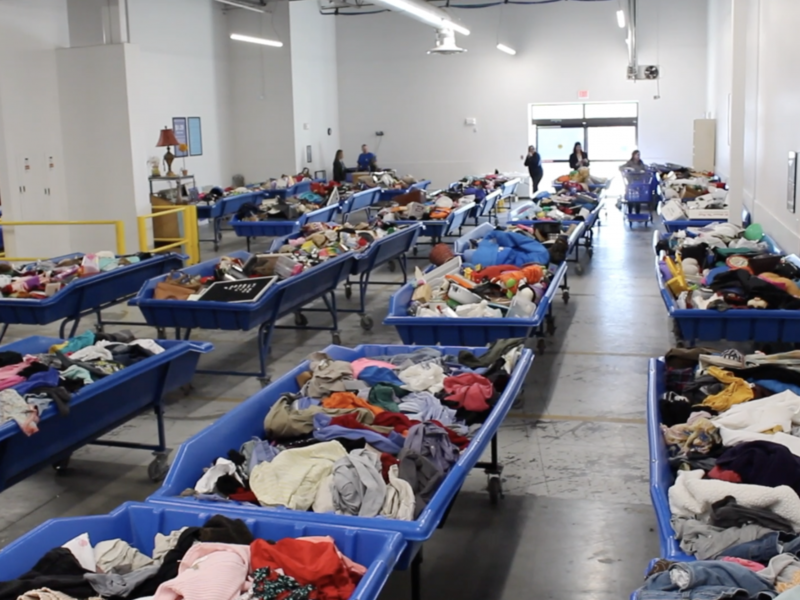 Our Day in the Life series takes you behind the scenes of Goodwill of Central Iowa’s mission. In the past, we’ve shown you the efforts of team members who work with jobseekers. 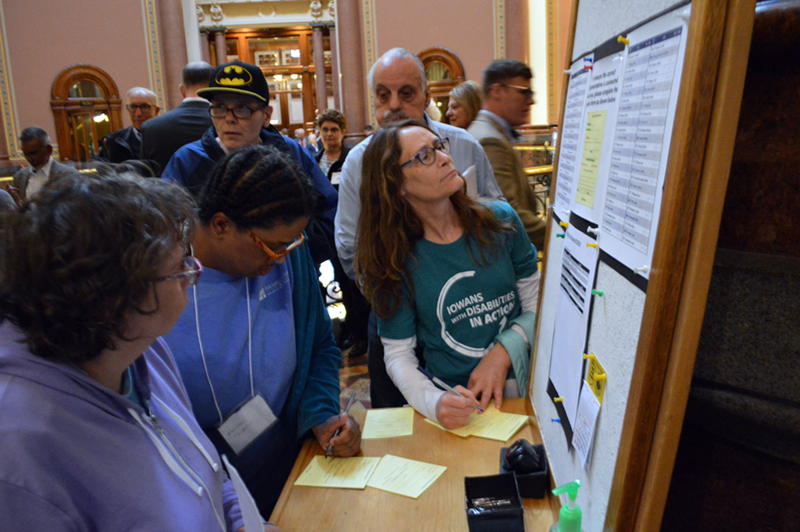 Today, we’re showcasing someone who works with participants with barriers that have earned a job but still need help maneuvering through the world of employment. Hannah Laabs is a job coach who navigates her job with a skilled touch. She carries a big smile and an even bigger heart into every part of her work. She provides one-on-one coaching, tailored to the needs of employees in order to aid them with career development, professional goals and long-term workplace success strategies. We caught up with Hannah to witness her impact firsthand. 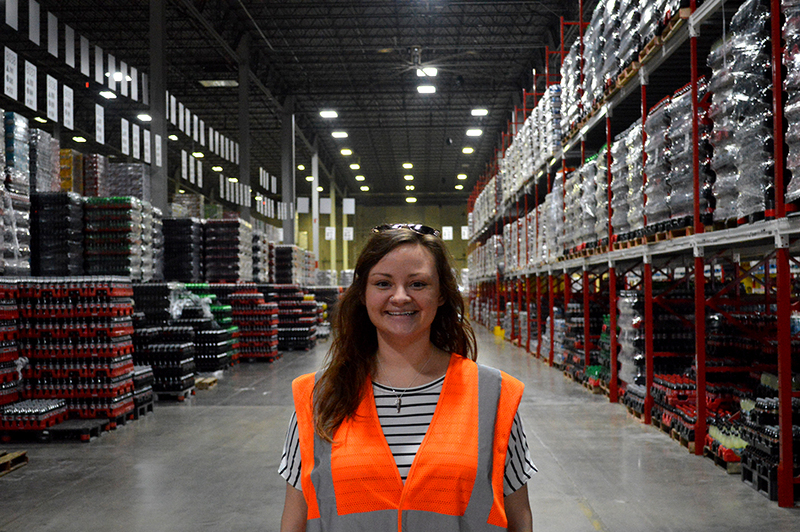 On a cold Thursday morning on the south side of Des Moines, Hannah’s first stop is the Atlantic Coca-Cola Bottling Company. The inside of the building is covered in everything Coca-Cola: clocks, chairs, tables, benches and even trashcans. 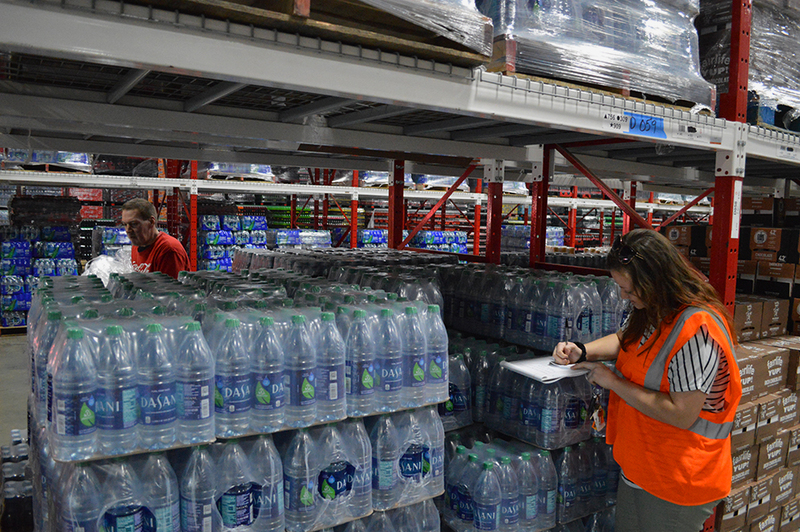 Hannah isn’t distracted by the impressive display; she heads through several doors until she enters the warehouse. She is greeted by a massive structure filled with all sorts of Coke products and forklifts whizzing around. All of the merchandise is wrapped in plastic and placed neatly where needed. 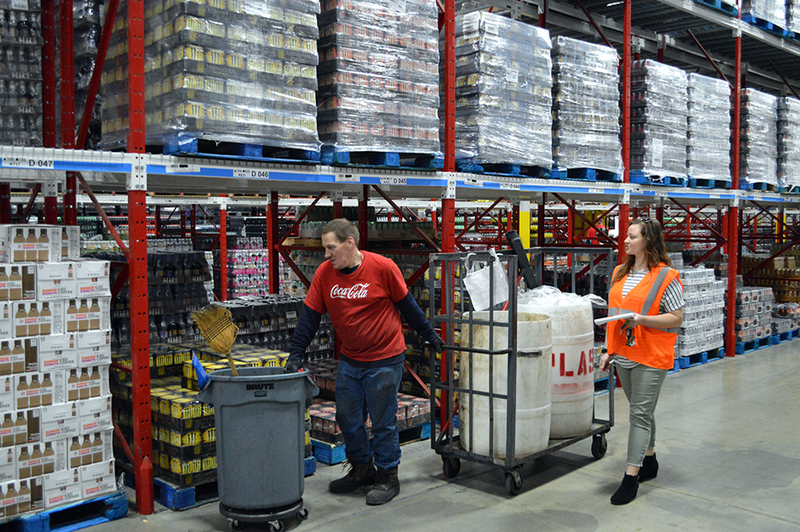 The warehouse is spotless and a lot of that is thanks to Chad, the participant that Hannah is meeting. After greeting Chad and catching up on the comings and goings of the warehouse, she lets him get back to work. Chad’s job is to pick up the discarded plastic at the end of each aisle and toss it into a compactor. He hauls around a cart with two industrial sized barrels for the waste. He is focused and proactive. When he sees that a pallet of product is almost finished, he opens the plastic wrap and stuffs its discards into his barrels. Hannah follows him at a distance and observes his efforts. When he first started, she needed to work with him on learning his responsibilities, but now he has memorized most of it. Hannah has a knack for letting her input come up organically. When they’re in the middle of talking about weather-related tasks for the upcoming snowstorm, his supervisor whips in on a quick moving hauler. They talk about the date for his upcoming employee performance review. When the supervisor leaves, Hannah asks if Chad knows what to expect and then explains the process. She then checks with him to see if he is fine with her sitting in on the meeting. She never assumes or takes control of his decisions. He has full autonomy. She is there to mediate, mentor and advise. One of the many impressive aspects of Hannah is her deep knowledge of each of her participants’ jobs. She is well-versed on Chad’s responsibilities, his break times and his coworkers. At several times throughout Chad’s shift, his coworkers stop Hannah to let her know how much they appreciate him and how much easier he makes their jobs. Hannah smiles broadly with pride. Before Hannah leaves, she talks with him about the proper way to ask for time off. She thinks he could benefit from some guidance but checks with him to see if he wants to work on it. He is already great at vocalizing concerns and problem solving, but Hannah coaches him to always improve. 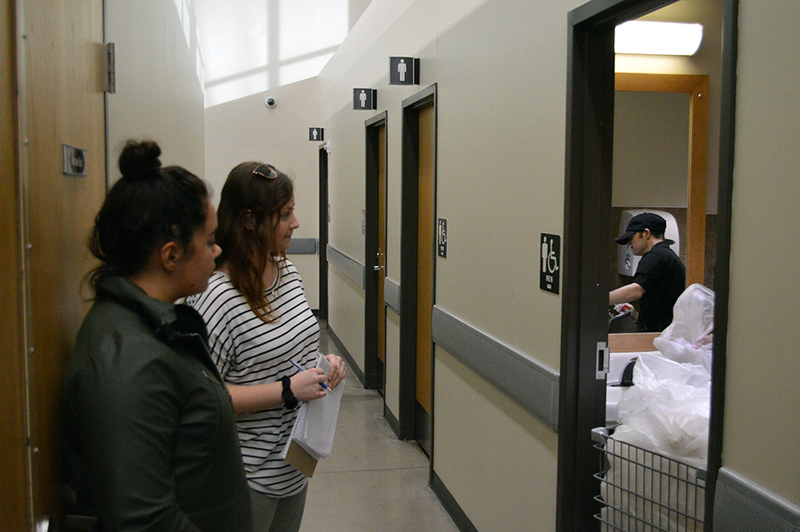 When Hannah exits the warehouse and turns her cell phone back on, she is greeted with six text messages from the next participant she is planning to meet. He was venting grievances about conflicts with coworkers. She texts him and lets him know that she on her way. She hops onto I-35 North and arrives at John Deere Financial within 20 minutes. Hannah’s next participant works as a dishwasher in a corporate cafeteria. This location houses more than 1,000 employees. The cafeteria is impressive; it’s clean, modern and offers a wide selection of food. When she arrives, her participant is visibly in a poor mood. The kitchen staff has been stacking dirty pans on the counter in front of the industrial dishwasher. The participant is upset because he has to move them out of the way before he can start his tasks for the day. He likes things to be in place and if something deviates from that, he gets easily frustrated. Hannah advises him to talk directly to coworkers instead of going straight to his boss to complain. When Hannah addresses him, she uses a stern tone but makes sure to give him plenty of encouragement. “You can do it. I know it. Now prove it to yourself,” she says to him. With that, she steps back and lets him get back to work. The participant has a tendency to concentrate intently on what he’s doing. It’s something that can be a great asset if given the right guidance. Hannah know that if she’s talking with him that he’ll stop what he’s doing so he can focus solely on her. She knows that she can be most effective today by stepping back and observing to make sure he’s hitting all of his goals. One of the challenges of being a job coach is the stigma that comes along with the position. It’s an easy misconception that Hannah is there to be a participant’s only means of support. When they have something to say, they’ll talk to her instead of their team members. On her way out of the cafeteria, the staff give Hannah well wishes for her upcoming trip to New York City. She’s an affable person who connects with people wherever she goes. Because of this, she easily develops relationships with her participants, their bosses and coworkers. When Hannah reaches the Waukee Hy-Vee, she is welcomed by the cheerful charm of Joel. The man is a sweetheart. He loves his job and his coworkers. Joel maintains the cleanliness of the restrooms in the store. To help Joel learn his role, Hannah created a binder of responsibilities. He would have had difficulty understanding a written task list, so Hannah put in the effort to convert the list into a visual format. He’s currently in the process of memorizing it, so Hannah makes sure to quiz him as he goes about his day. She is more hands-on with Joel, but once he gains more confidence and knowledge of his position, she will shift to more of an upkeep approach. Joel’s favorite part of his job is when he gets to clean the Hy-Vee café because he has many friends working there. The only thing standing in the way of this is a row of restrooms to be cleaned. If he can complete them fast enough, he’ll have time to manage the café. Hannah uses this fact to motivate him. She times him and challenges him to complete his current project with a deadline in mind. Hannah’s most important quality is her belief in the people she works with. Some people might think individuals with disabilities don’t have what it takes to maintain employment, but Hannah knows better than that. She believes that with the right guidance, these participants can create a better life and a greater sense of self-worth for themselves. Hannah’s work is important. According to the Bureau of Labor Statistics, 18.7 percent of persons with a disability were employed in 2017, compared to 65.7 percent of those without a disability. With the efforts of individuals like Hannah, more individuals facing barriers will be set up for success in their journey toward employment. Goodwill of Central Iowa is dedicated to inspiring all individuals to achieve independence through meaningful employment, believing that by improving lives, we improve our communities. 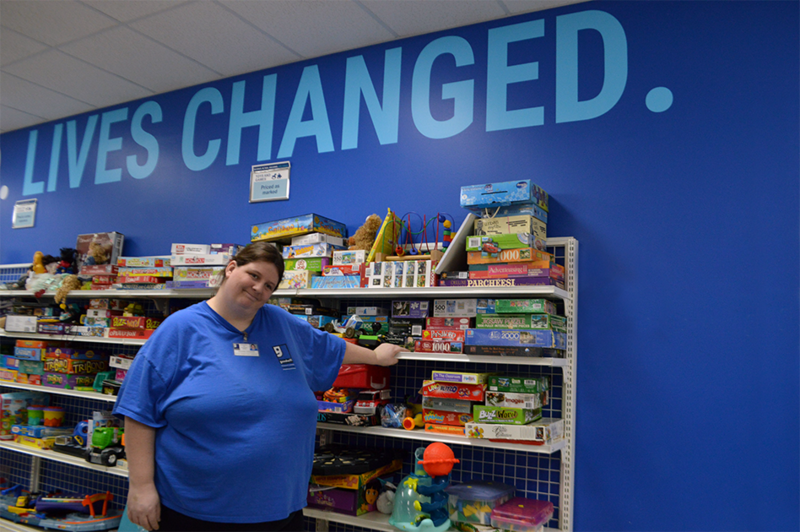 When you donate and shop at Goodwill of Central Iowa, you make work like Hannah’s possible. 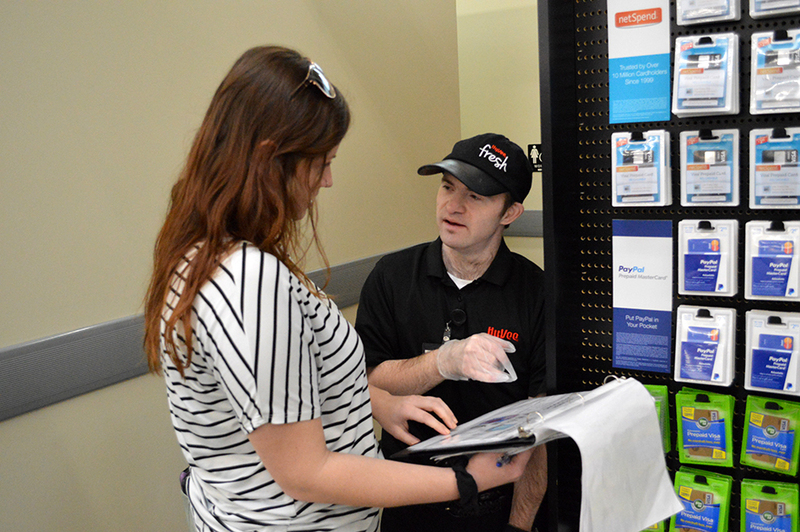 In fact, 85 cents of every dollar earned in our retail stores and through shopgoodwill.com goes to support our mission of improving the quality of life for all individuals by providing skills training and helping people find jobs. Find the location closest to you or make a monetary contribution today.